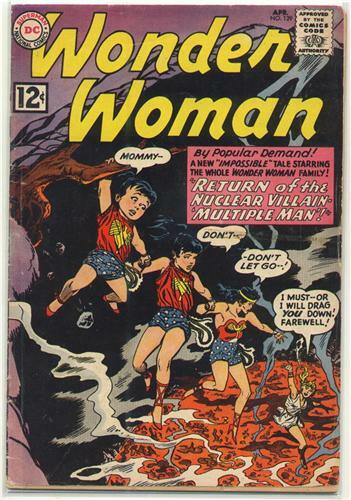 "The Return of Multiple Man"
Featuring Wonder Girl, Wonder Tot, and Queen Hippolyta. Good : spine starting to split & cover pulling away at staples, thin 1/2" rectangle out back outer edge, 2" streak of residue right center front cover, corners worn down, overall nice with moderate handling. Complete, centerfold tight to staples, tan pages with light corner wear & occasional creases. Image of actual item shown. Bagged & boarded.